How to Make Ringtones for iPhone 5S/iPhone 5C/iPhone 5/iPhone 4S/iPhone 4/iPhone 3GS/iPhone 3G? As expected, the new iphone 4S is really a major upgrade over the iPhone 4. It comes with a faster processor, a bigger display, Apple' s iOS 5, near-field communication, more storage and more other new features. However, it does not make any improvements on the way you get the iphone 4S ringtones. 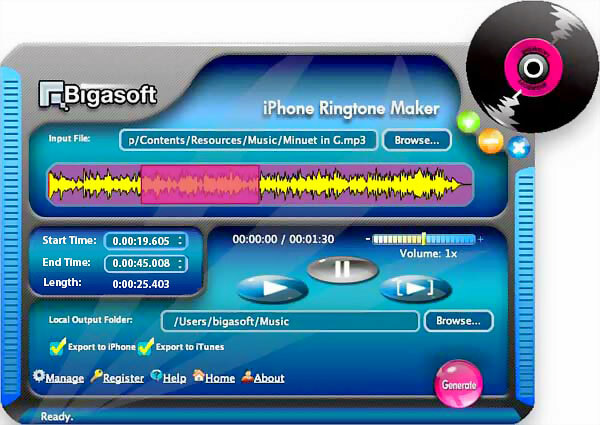 Luckily, we have Bigasoft iphone 4S Ringtone Maker which will change your way to get your ringtones for iphone 4S. With this powerful iphone 4S Ringtone Maker, you can make ringtones for iphone 4S by yourself: make iphone 4S ringtones from various audio; make ringtones for iphone 4S from all kinds of music video; make iphone 4S ringtones longer than 30 seconds; increase ringtone volume. 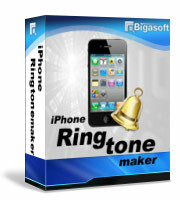 Bigasoft iphone 4S Ringtone Maker can help to easily set all kinds of songs as ringtones for iphone 4S. It can easily convert whatever format of audio to iphone 4S ringtone including MP3 to iphone 4S ringtone, M4A to iphone 4S ringtone, WMA to iphone 4S ringtone, APE to iphone 4S ringtone, WAV to iphone 4S ringtone, FLAC to iphone 4S ringtone, OGG to iphone 4S ringtone, APE to iphone 4S ringtone, MP2 to iphone 4S ringtone, VQF to iphone 4S ringtone, AAC to iphone 4S ringtone, AUD to iphone 4S ringtone, AIFF to iphone 4S ringtone, CAF to iphone 4S ringtone and more. Sometimes, our favorite audio clip is from music video or games, but we also like it to be our iPhone ringtone. In this situation, Bigasoft Ringtone Maker for iphone 4S is just the right solution. It can extract audio from video and then convert them to ringtone M4R for iphone 4S. This powerful iphone 4S Ringtone Maker supports all most all kinds video formats including MP4, MOV, AVI, BIK, MPEG, WMV, 3GP, MKV, FLV, ASF, AVCHD, RM, DivX, XviD, WebM, VP8 etc. Most of the ringtone creator can only make iPhone ringtone less than 30 seconds. Luckily Bigasoft iPhone Ringtone Maker can make iPhone ringtone in any length, you can make it less than 30 seconds, or longer than 30 seconds, 40 seconds or even 60 seconds. Have you ever missed iPhone calls just because of the low ringtone volume? Even if the volume is loud enough, we still can not hear it in noisy environment. Therefore, it is necessary to increase iPhone ringtone volume as loud as possible. Once again, the ideal ringtone maker for iphone 4S will provide a nice solution. The following is a step by step guide on how to make ringtones for iphone 4S from various audio and video, how to get iphone ringtone long to any length, how to make ringtone to any desired volume. Free download the professional iPhone 4S Ringtone Maker - Bigasoft iPhone Ringtone Maker (for Windows, for Mac), install and run it, the following main interface pops up. Click "Browse..." button to add your favorite audio or video that you want to set as ringtone; or your can directly drag and drop your file to the mail interface of this iPhone 5 Ringtone Maker. Type in the start time of your ringtone in the text box next to "Start Time"
Type in the end time of your ringtone in the text box next to "End Time"
Drag and release on "Volume Maker" slider to set ringtone to desired volume level. Connect iPhone 4S to computer, check before "Export to iPhone" and "Export to iTunes", and then click "Generate" button, this ideal Ringtone Maker for iPhone 4S will fast create ringtone from the source file as well as transfer the created ringtone to the ringtone folder in both your iPhone and iTunes.